The Verily Study Watch is a prescription-only wearable that can record, store, transfer and display single-channel ECG rhythms. This morning Alphabet’s life science subsidiary Verily announced that its Verily Study Watch and its on-demand ECG feature landed a 510(k) clearance from the FDA. The watch is a prescription-only device, and was designed to record, store, transfer and display single-channel ECG rhythms. The company said the device’s ability to take on-demand, single-lead ECG can be used for individual patient care or for population-based research. The latest announcement comes nearly two years after the life science company launched the Verily Study Watch. Unliked consumer smartwatches, the device was designed with research in mind; the investigational tool collects health data from clinical research participants. The device has been used in a number of studies including Verily’s Project Baseline, Aurora study and Personalized Parkinson’s Project, according to a statement. The technology was designed to help researchers gain insight into what is happening inside the body, according to the company. This ECG feature in particular helps researchers working on heart disease. In September the Apple Watch became the first consumer wearable to land FDA approval for a built-in ECG. Since then other tech companies have been racing towards implementing the technology. 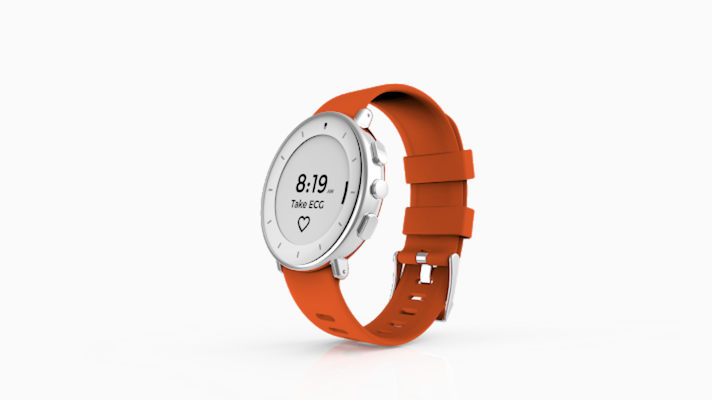 Last week at CES, French digital health company Withings announced the Move ECG, a combined ECG monitor and activity watch. The company noted that its watch was still a “soon-to-be FDA cleared” product. Although the Verily Study Watch was designed specifically as an investigational tool, other smartwatches have also been used in research. In fact yesterday Johnson & Johnson announced plans for a multi-year research program to explore the role Apple Watches could play in monitoring senior health. The study is looking to measure whether or not the smartwatch’s irregular rhythm notifications and a medication adherence app designed by J&J for the smartwatch might have an impact on the health outcomes of older adults. This isn’t the first time an Alphabet subsidiary has been in the news for wearables this week. Just yesterday, word broke that Google agreed to pay $40 million to acquire a still-under-development smartwatch technology from Fossil Group. There are still a lot of unknowns about the technology that was purchased, but there is reason to believe it is health or wellness-related.